On 4 May 2018, the Moroka Hall of Residence by Activate Architecture received a Corobrik-SAIA Award of Merit at a gala dinner at the ArchitectureZA 2018 Festival held in Pretoria. 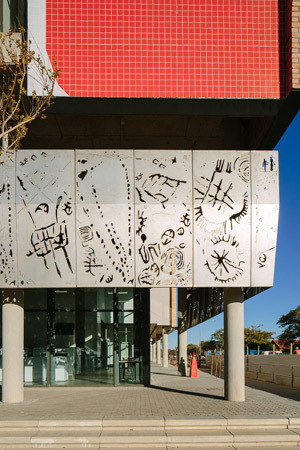 The residence is a key component of the new Sol Plaatje University, the first university in the Northern Cape. 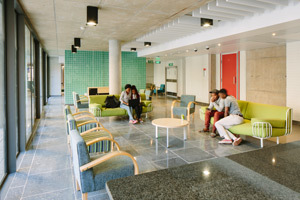 The residence provides safe on-campus accommodation for students coming from remote areas of the Northern Cape, and is situated on the open campus with public access to the squares and walkways between buildings, resulting in daily interaction between the university and the city. The building is predominantly a student residence with mixed use facilities and large communal spaces on the ground floor facing onto a semi-public square. These facilities include small retail shops, a laundromat and offices, which were positioned to activate the building edges and public spaces. All the residential rooms are located on floors one to four, accommodating a total of 290 beds. The aim is to provide a comfortable and safe home for students on campus, in a setting that stimulates learning and development individually and collectively. The layout of the residence is designed to promote formal and informal interaction and connections between the residents, and all spaces are considered as learning spaces, since learning and thinking can happen in a tranquil garden or an informal discussion as much as it can at a desk or in a lecture hall. Two types of residential accommodation are provided – shared apartments with six to eight individual bedrooms and shared ablutions, kitchenette and living area; and dormitory-type rooms with communal ablutions, kitchenettes and social spaces. A lot of effort went into giving the building contextual relevance. The landscape and imagery of the Northern Cape was laser cut into the 375 meters of balustrades and a sun screen running 74 meters, the entire length of the public square. These depict the markings of human endeavour particular to the rich heritage of the Northern Cape. The building's optimised response to its environment is integral to all aspects of the design. 80% of the rooms receive north winter sunlight and are shaded from summer sunlight, and all rooms are naturally ventilated. 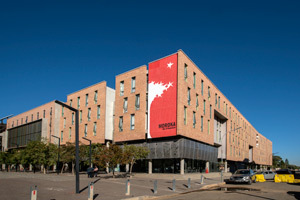 The envelope of the building is highly insulated, and passive design techniques have been augmented with a thermally activated building system (TABS), which provides additional comfort in Kimberly’s harsh climate at a fraction of the energy consumption of conventional electrical systems. The TABS uses the building structure for thermal energy storage, with water pipes looped into the concrete floor slabs, through which warm water is piped in winter and cool water in summer. With no ceilings and a large structural mass, a very stable internal temperature is created, and very little energy is required to overcome peaks and drops in temperature. This system is driven by a heat pump in the centralised plant and services building that supplies heat and cooling to four buildings on campus, with a potential for another two. Water consumption has also been significantly reduced with a full grey water treatment and recycling system on site that allows all water from showers and basins from this and neighbouring buildings to be used for toilet flushing and irrigation throughout the campus.